season, so many migrants are in their “basic”, or non-breeding plumage. Males that were bright and colorful in the spring and summer are now either becoming or are already dull and brown. For example, Rose-breasted Grosbeak males have black heads and backs with bright rosy breasts during the breeding season, but in the fall the males still have their rosy breasts, but they aren’t quite as bright. 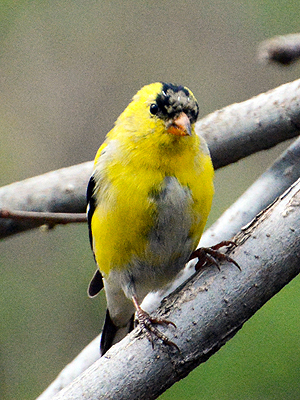 And some birds like the American Goldfinch pictured here, molt to a dull color that looks similar to the female. Another tricky thing about fall migration is that in comparison to spring migration, it is protracted. Spring migrants are in a real hurry to get to breeding grounds and find a good place to nest. Fall migrants don’t have the same sense of urgency as they generally don’t need to establish territories on the wintering grounds. This means that fall migration takes place over a longer period of time, but this can be good for birdwatchers! Spring migration can be very chaotic and birders feel pressure to get out every day and see as much as possible. Fall migration birding is much more relaxing. Birds tend to stick around for a little longer, so even if identification is more challenging, you have a little more time to work on it. Also, birds migrating in the fall are a lot quieter. You wont hear beautiful loud songs from the songbirds now as you would in the spring as they are not trying to impress mates. This makes it more difficult to see the birds (for both us and predators) as they are not announcing their presence, but are making their way silently to their winter homes. Where to find birds during fall migration isn’t that different from spring. Weather and wind direction can play a huge role in how many migrants might be hanging out in your area. Migrants tend to follow coastlines, and in areas that have very few woodlots, they tend to concentrate in the little forested habitat that remains. City parks with lots of trees, such as Central Park in New York City or Montrose Park in Chicago, can be great places to look for migrants. Some birds flock in large numbers and gather at certain key stopover sites. 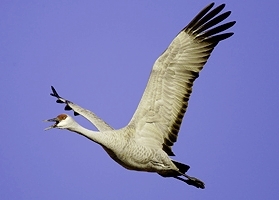 Jasper-Pulaski Fish and Wildlife Area in Indiana is a great place to see thousands of Sandhill Cranes in the fall. September is a great month to test out your fall migration skills. Don’t miss the action — get out and bird today!